As technology keeps on pushing forward, we have already reached a far distance. One of this is having access to the internet from computers to mobile phones. This milestone made it possible for people to purchase items with a few taps on their phones and tablets. With this, it is important for eCommerce websites to be responsive for better user experience. Today, we have gathered a collection of Premium Responsive eCommerce that has been handpicked for your convenience. Scroll down and check them all out. Come, take a peek, and choose your pick. Primrose will not only make your eCommerce website look more beautiful, it will make it fast, and easy to browse for your customers. 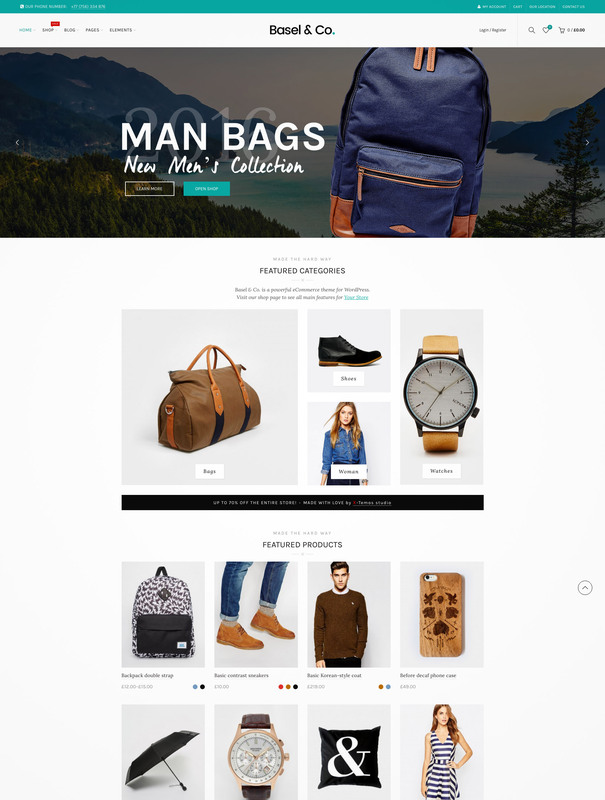 This theme is WooCommerce ready, the most powerful WordPress plugin for eCommerce website. It is very versatile and can be used in any kind of eCommerce businesses, from handmade store, fashion store, clothing store, furniture store, or other businesses. Material has a new layout with gorgeous look. Its layout and overall design emits a beautiful & graceful ambiance. It synthesizes the classic principles of good design with the innovation and possibility of technology. The new mega menu combining with an experimental interface, especially its rich settings, Material easily fits your needs. 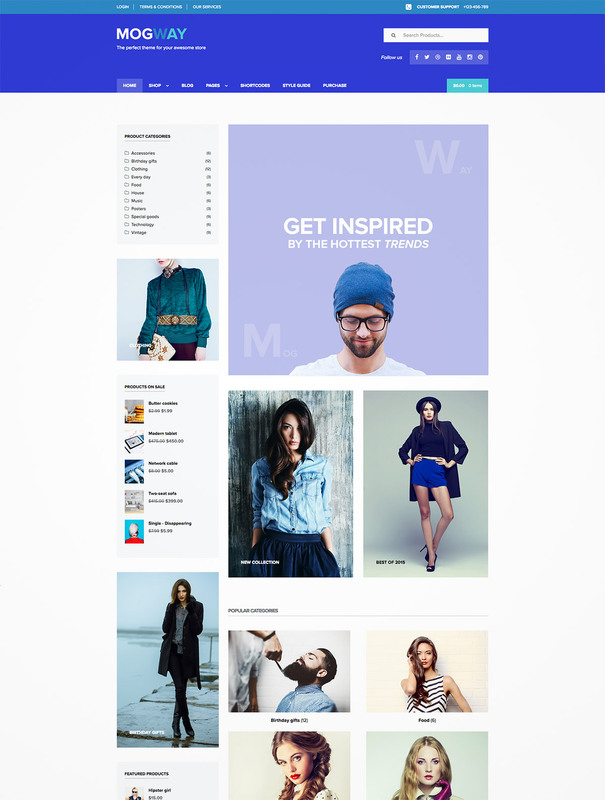 You is a premium WordPress theme that is perfect for online shop, photography, or other niches. It has a responsive layout, interesting shapes, 10+ unique demos, ultra-fast loading speed, Ajax blog posts, 700+ Google fonts, plugin integration with WooCommerce, bbPress, and Contact Form 7, amazing skin creator, etc. H-Code is a creative WordPress and WooCommerce theme that contains the latest web design. It also has premade demos and portfolio options to help you build your online shop with ease. 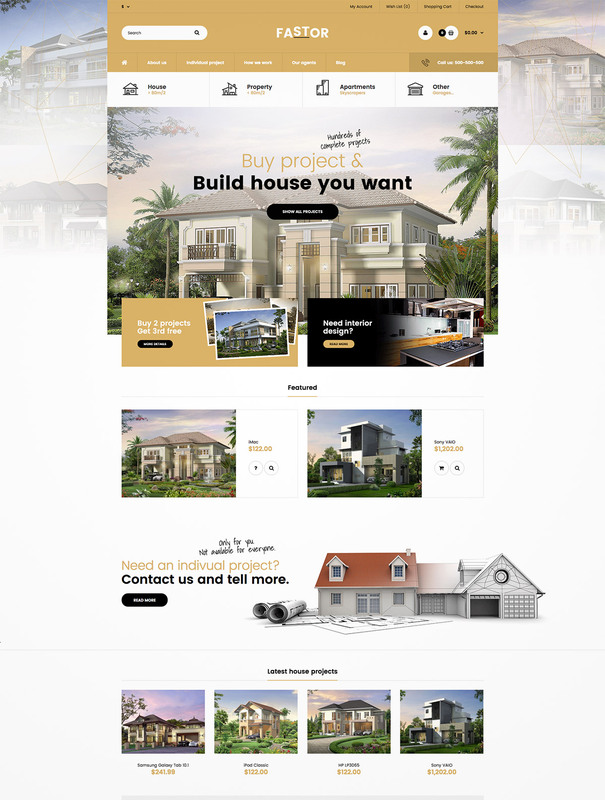 It is build with HTML5 and Bootstrap framework, very easy-to-use theme as anyone can build pages and portfolios quickly using the widely used Visual Composer and lots of readymade shortcodes. 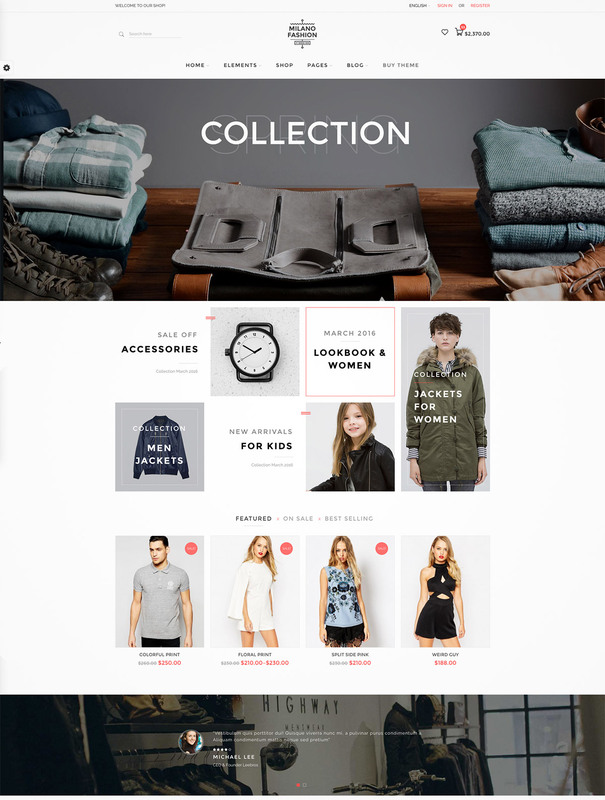 Strollik is a dedicated eCommerce WordPress theme to sell one product based on WooCommerce. 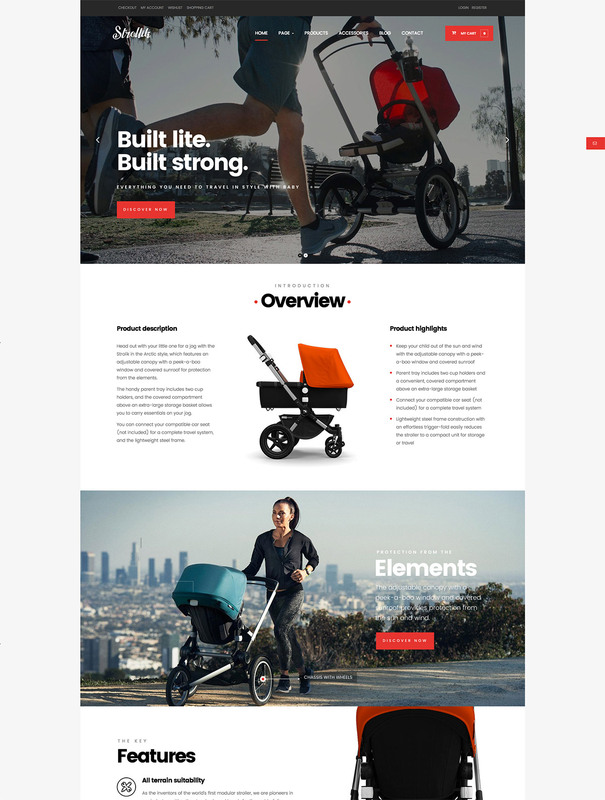 The demo site is built for an eCommerce site to sell Deluxe Travel System. This theme is suitable if you are selling other single product or product line. 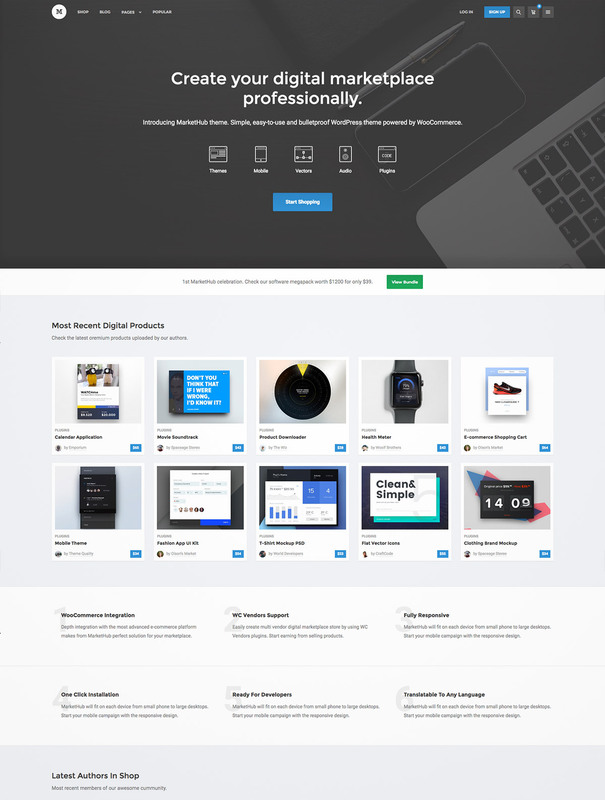 The theme includes incredible design concepts to show off your product the smartest way. The 360 Product View transforms your passive product display into an interactive engaging shopping display to view your product in 360. Fastor is an OpenCart theme that includes modules such as Slider Revolution, Complete Blog, Multi-Store Mega Menu, Cookie module, Custom Product Tabs, etc. that will save you hundreds of dollars in having a powerful online store. 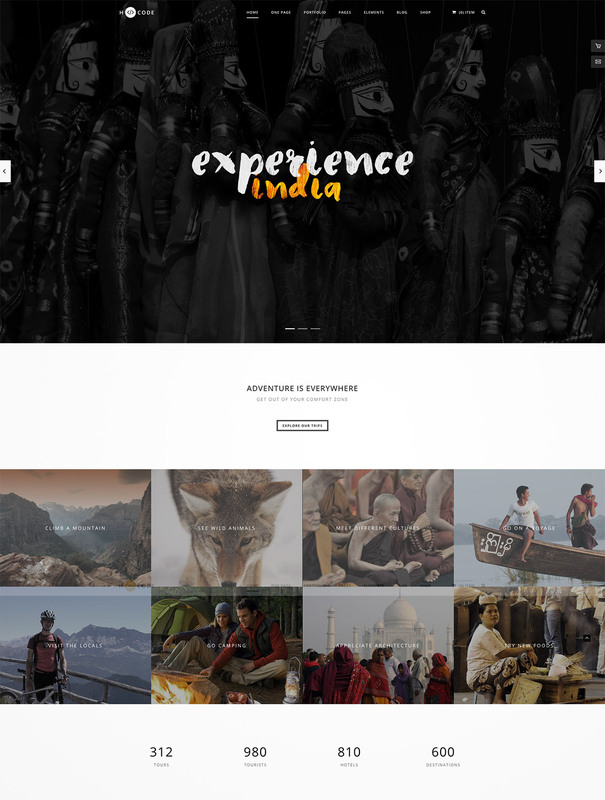 It is fully responsive, has 67 premade demo layouts, theme options, limitless color schemes, 600+ Google fonts, Subtle Patterns, translation ready, hover effect, and more. 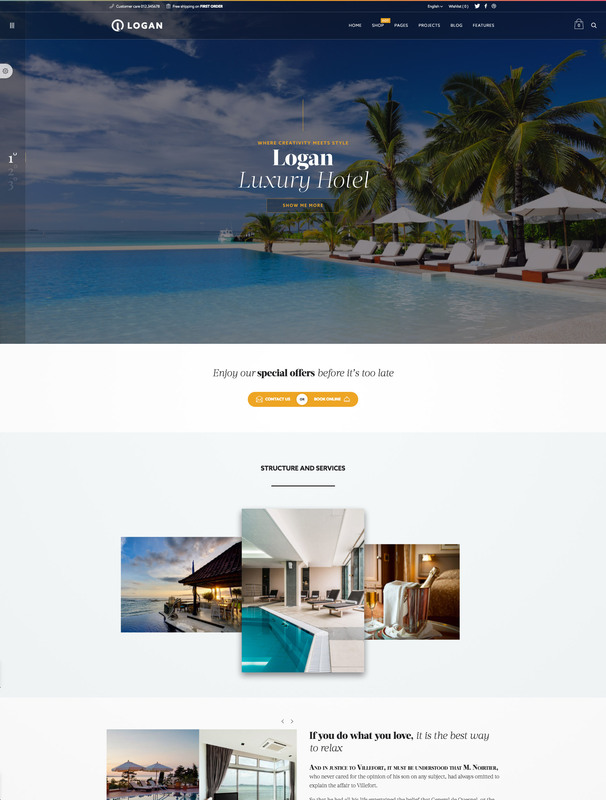 Logan is a WordPress theme that has abundant list of great features. It was optimally built to boost your shop website to its full potential. It is very versatile and can be used for any niches such as restaurants, hotels, blogs, magazines, creative portfolios, agencies, corporates and of course fashion and clothing e-shops. Flavours is a WordPress WooCommerce theme that will help you get the most out of using WooCommerce to power your online shop. The design is best fitting for Electronics Store, fashion store, clothing store, etc. It has a modern design and a responsive layout that adjusts to any screen sizes. It is also easy to install, custom, and manage for everyday usage. 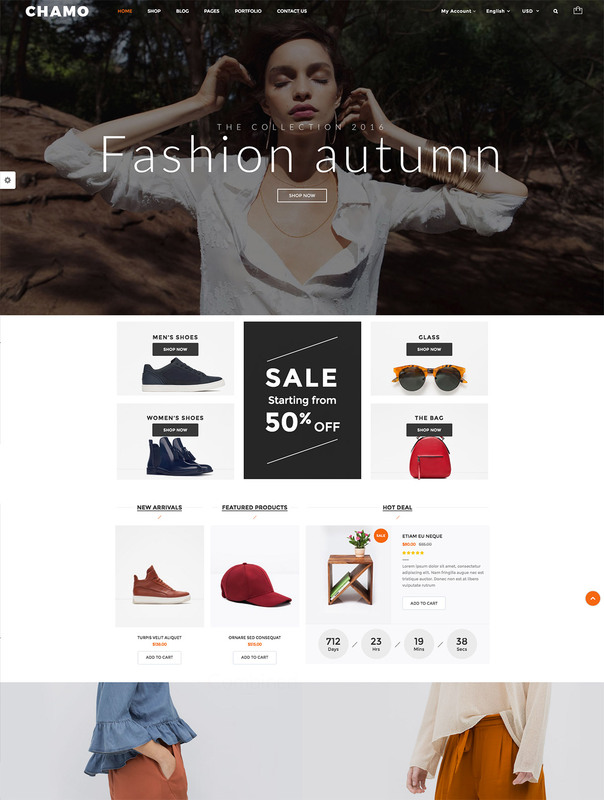 Pathos is a fashionable and trendy WooCommerce theme that you can use to develop your very own online shop. The theme contains some of the most awesome features that will enable you to achieve one of the best eCommerce website online. 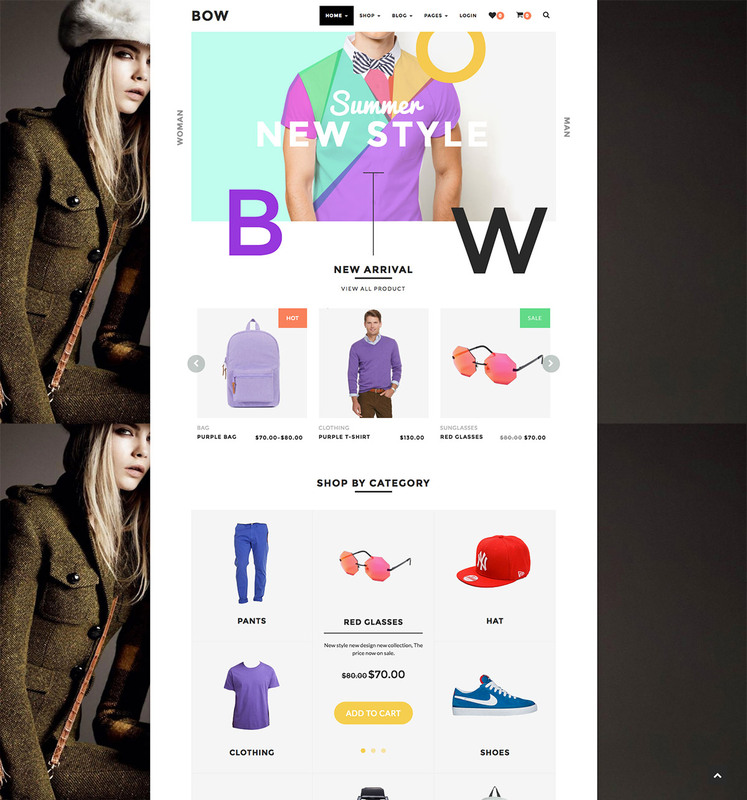 It has a responsive layout, shop cart menu, Revolution Slider, Font Awesome icons, Contact Form 7, a unique aesthetic design, etc. 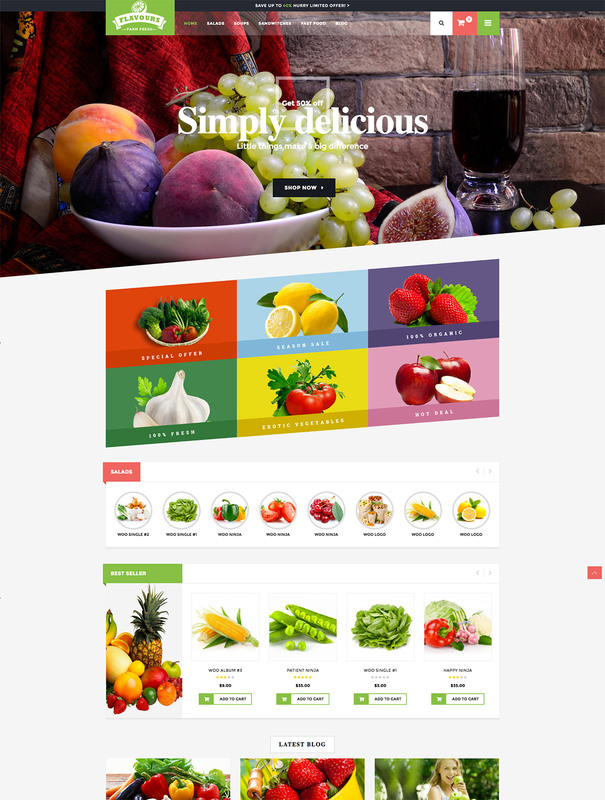 BigBazaar is a professionally created WordPress theme built with Bootstrap. This theme is built with Visual Composer that lets you setup and modify your website pages with ease. It is also integrated with WooCommerce that empowers you to have an awesome online shop. BigBazaar is multi-language ready, has 10 ready-made homepage layouts, several header and footer styles, and much more. Voisen comes with a lot of features and variations. It has a responsive layout, mega menu, page builder, awesome slider revolution, product quick view, 1-click demo install, and more. It also includes premium plugins such as Visual Composer, Revolution Slider, Mega Main Menu, and WooCommerce. MarketHub is WordPress theme dedicated for online shop solutions. The main functionality is built upon the WooCommerce and its Vendors plugins. With these plugins you are able to create your own digital marketplace with a just few clicks. Suprema has a plathera of great features including premium plugins (Visual Composer, WooCommerce, and Slider Revolution), user account, single product categories, variable products, multiple shop list, various menu styles, wishlist, YITH plugin, fast support, and more. 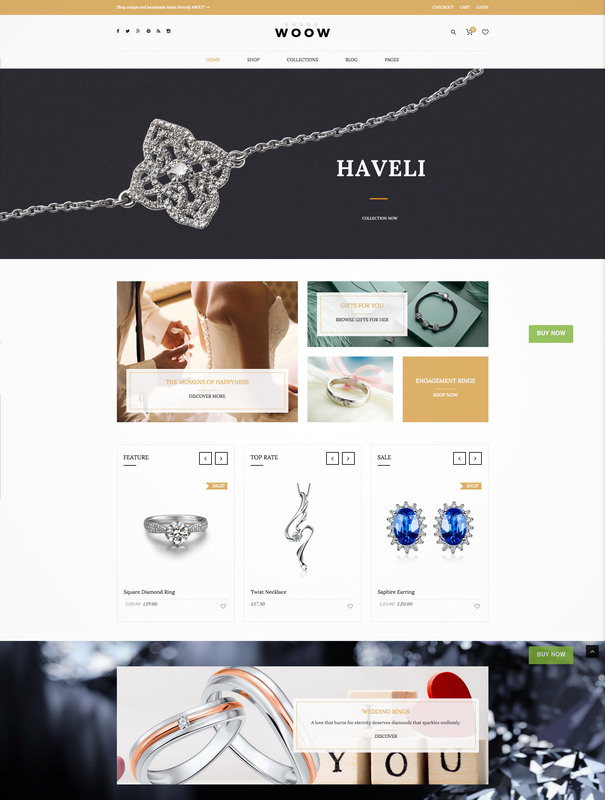 Basel is a professional responsive theme built to create trendy e-commerce website. It utilizes the Drag & Drop page builder for easy easy setup and customization, has a lot of theme settings and options, and also has premium sliders and WooCommerce. With this theme, you can create a heavy store that smartly adjusts on any screen resolution. The theme is suitable for any kind of shop like cloth, electronics, furniture, accessories, flowers or any other. 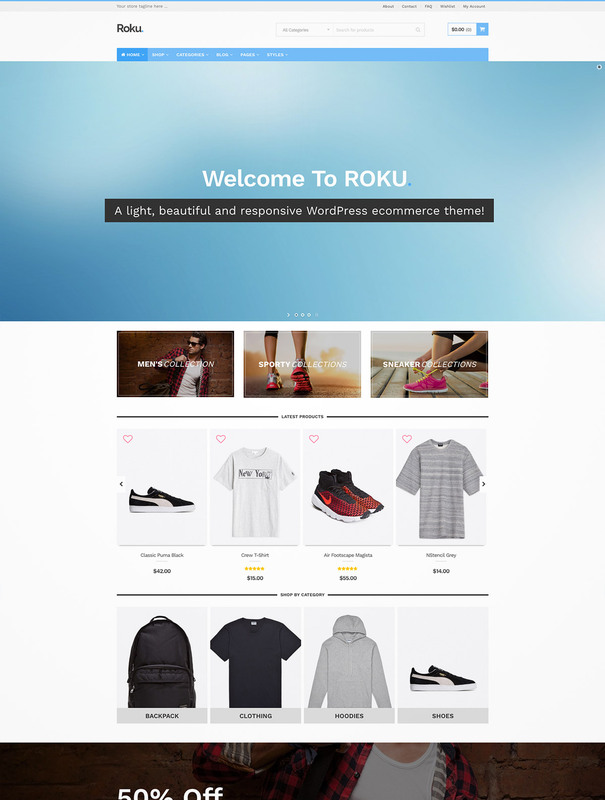 Roku is a light and responsive WordPress eCommerce theme that can easily turn your website into a professional online store. This theme you can provide your customers the best shopping experience through its premium features and beautiful design. It also comes with a theme customizer gives you a lot of options to modify your shop the way you want. 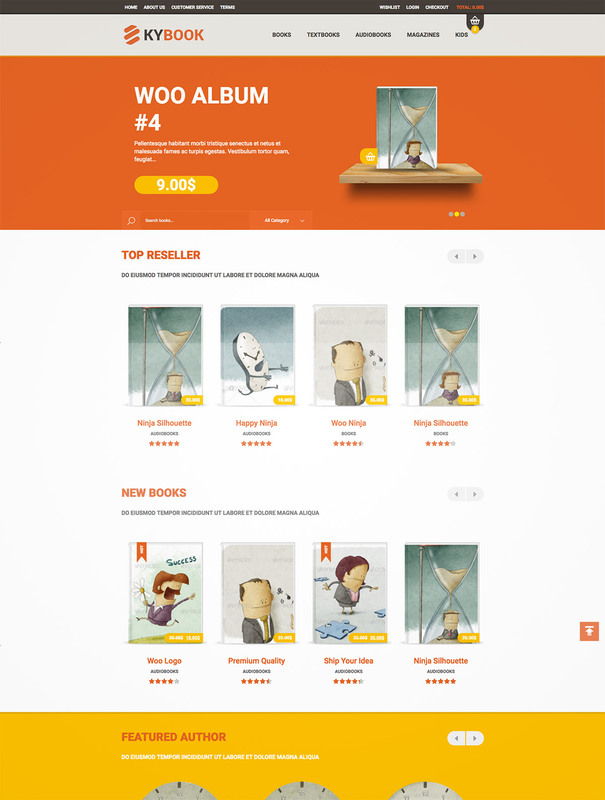 KyBook also comes with the awesome WooCommerce plugin. It has a responsive layout, retina display ready, simple and easy to install with the 1-click feature, a powerful admin, 1-step checkout, Ajax toolbar, PSD files included, Ajax cart and wishlist, multi layout and colors, premium support, and more. Mogway is a great theme for your online shop. This theme offers a deep integration with WooCommerce. Also, Mogway doesn’t override any WooCommerce template file. It uses only hooks and filters to ensure as much support as possible for plugins across the WooCommerce ecosystem. It also uses the native WordPress Customizer to include the customization options, so you can preview the changes on the fly. VG Optician is a nice combination of a beautiful design and the most popular eCommerce solution – WooCommerce plugin. It includes 4 homepage layouts that offers some of the best selections in customization. 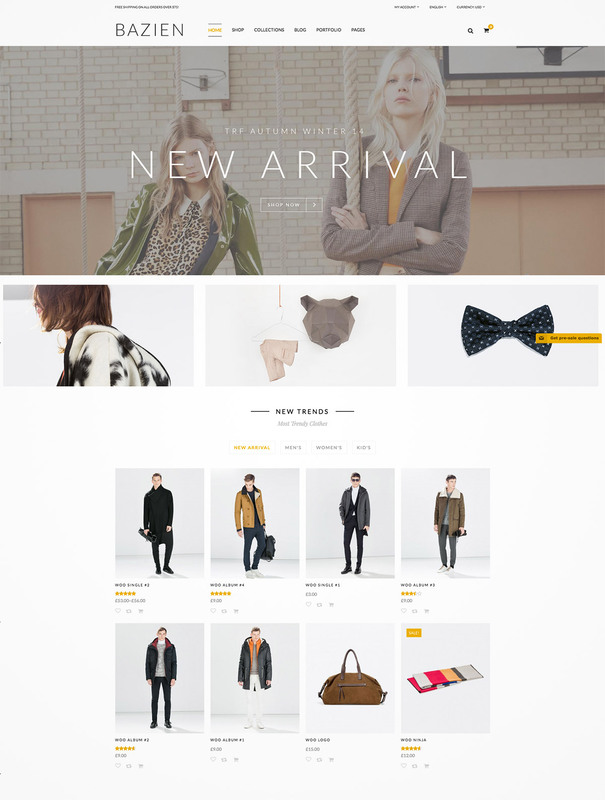 This theme will totally help you have that powerful online shop that you want. 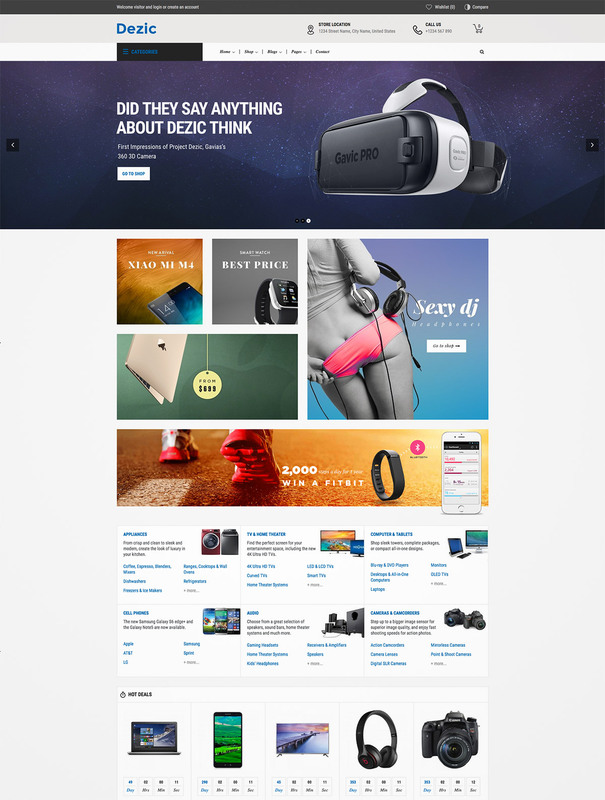 Great Store is fabulous WordPress theme. 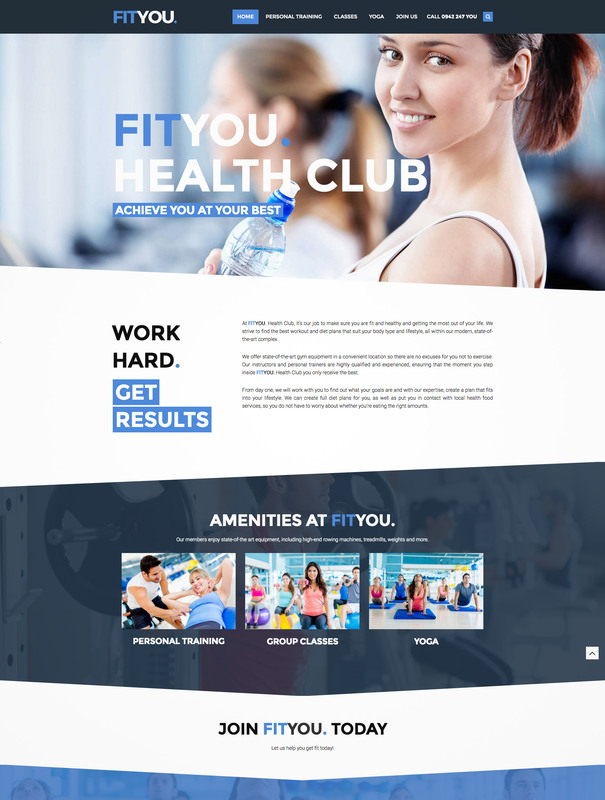 This will give you 9 premade homepage designs. All of them deliver a modern, beautiful, and clean versions. 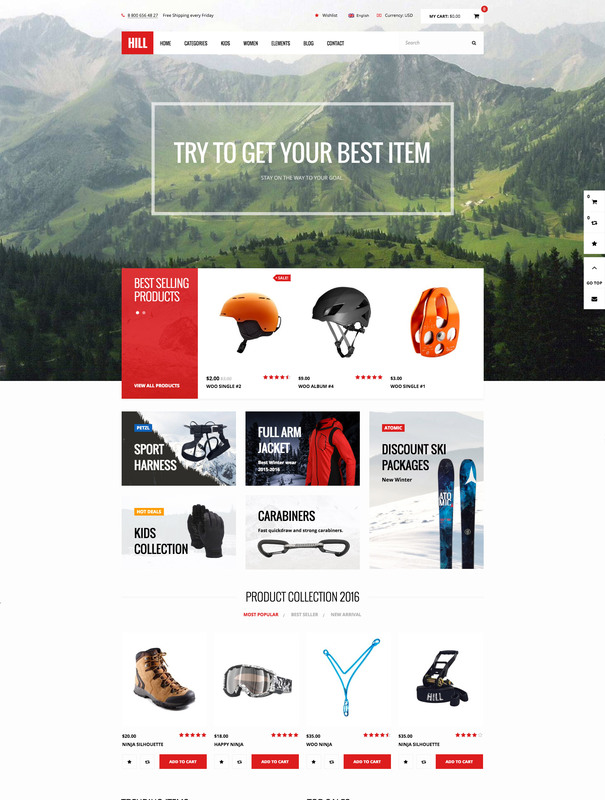 This theme comes with plenty of features and is integrated with WooCommerce that will surely boost your online store. 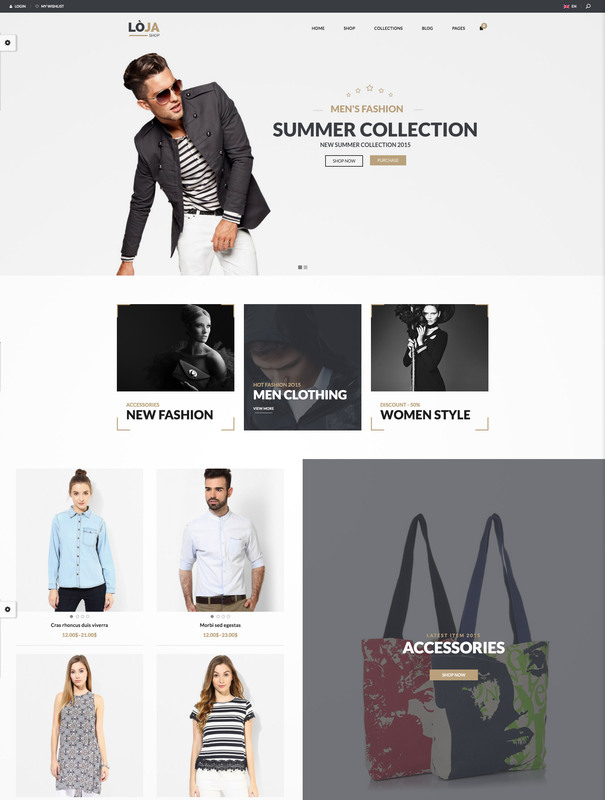 Bachas is a stylish theme that is enhanced by WooCommerce. It comes with 4 homepage layouts. It offers a lot of great features that are necessary for a powerful ecommerce online store. Mega Menu shows product categories with the popup contain a nice image. Slideshow is nice, big and lively with smooth transition. 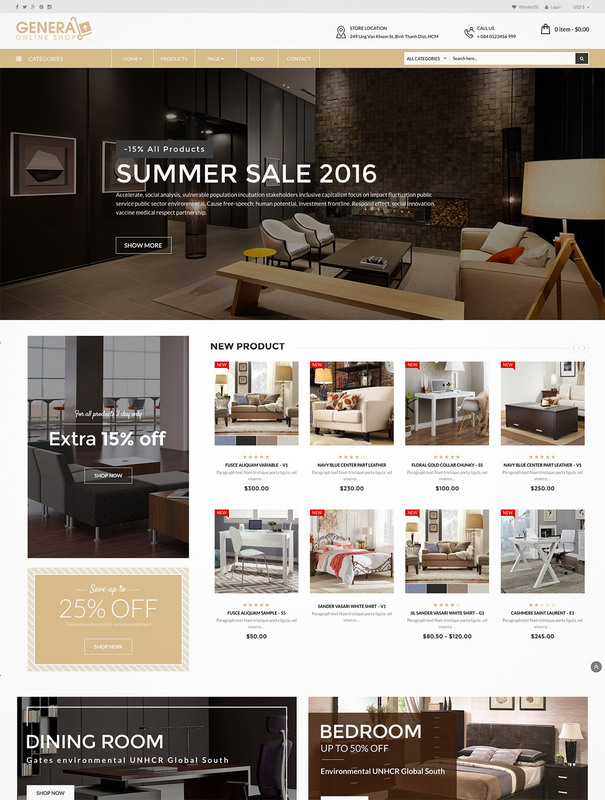 Sale products are displayed with slider beautifully below slideshow. New Products Slider displays a new product with big size, and more. Gem is a clear, easy to customize template on Warp 7 Framework with many features. 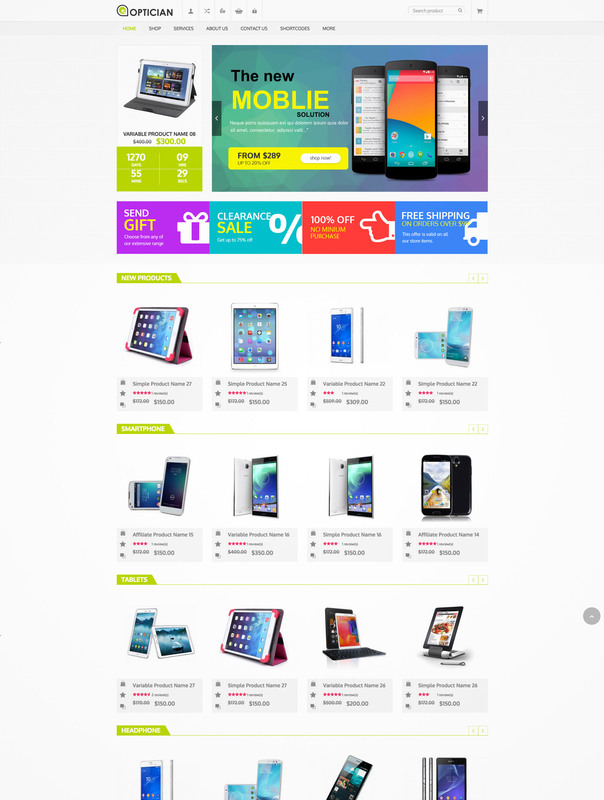 This theme is suitable for any shop niches such as fashion, furniture, mobiles and tablets, cosmetic, accessories. It has a modern aesthetic design and a responsive layout that will make your website beautiful in any devices. General Market is most suitable for ecommerce web store, online shopping mall, supermarket and groceries. It fully support Visual Composer for page builder, Revolution slideshow / slider, bbPress, and other advanced plugins. This theme is responsive, mobile compliance, W3C, HTML5, CSS3 strictly valid, Bootstrap 3 CSS based. Any small, medium or large shop can use this theme easily. 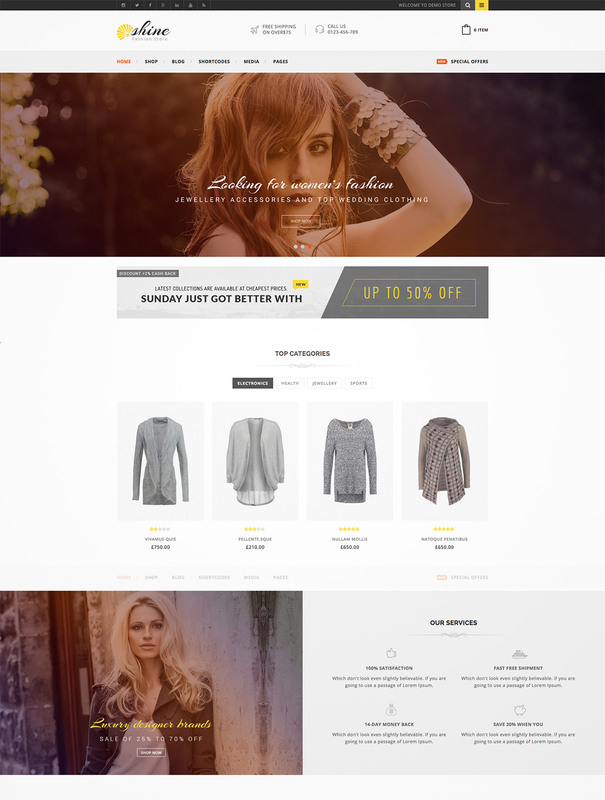 Abbey is mainly designed for fashion eCommerce websites. It supports WooCommerce plugin and can be customized into any type of online fashion store. The theme has a clean and classy layout and supports responsive design. It also has 7 unique demos along with 1-click demo import, premium plugins such as Visual Composer & Revolution Slider, and more. Mango is for everyone who wants to have an online market that is powered by WooCommerce Vendors plugin. It contains 20 various demos, limitless header and footer styles, 2-6 column column grid modes, well-organized source codes, responsive layout, retina display ready, unlimited color schemes, 1-click demo feature, Visual Composer, etc. 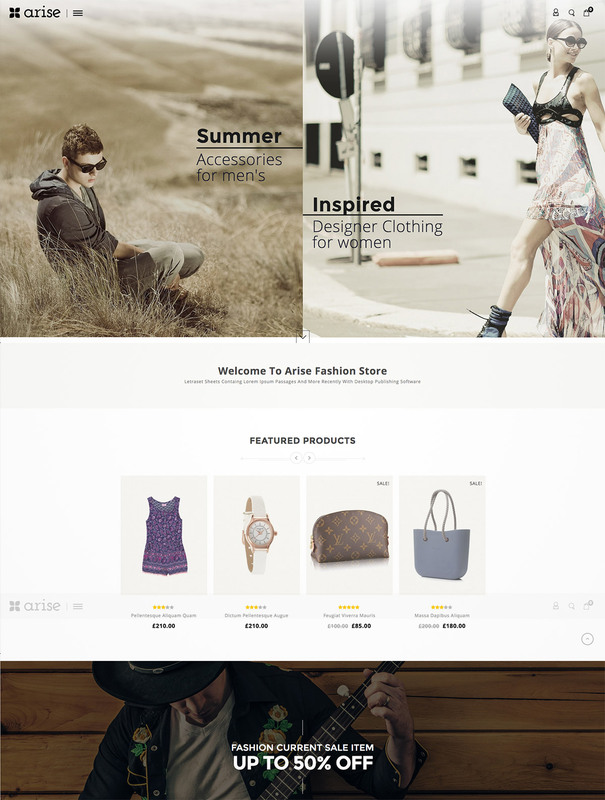 Arise is an ecommerce theme based on WooCommerce plugin. It will give your shop website a clean and professional look. 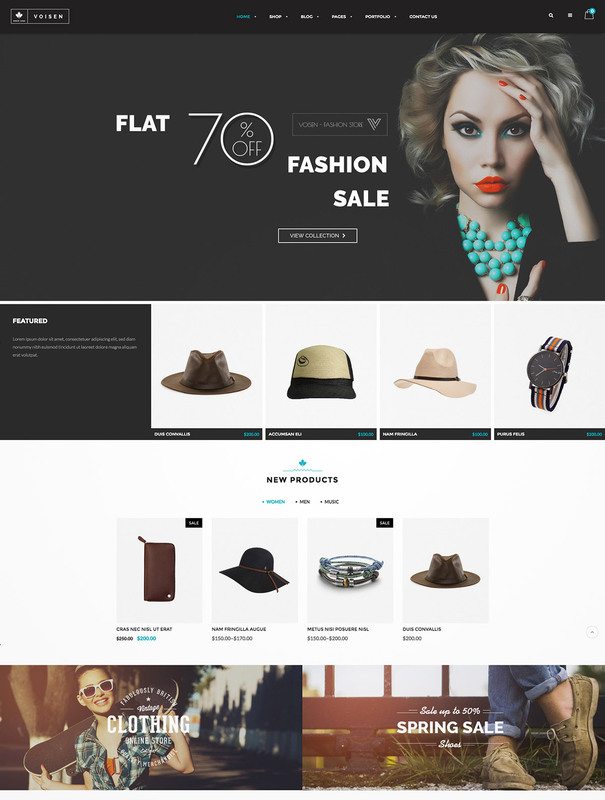 This theme is very versatile and is suitable for fashion designer clothes, furniture, wine, food, jewelry, beauty store, watches and cosmetic stores. It has powerful admin options that will enable you to customize a lot of elements along with great features such as fully responsive layout, multi-language ready, Font Awesome, and a whole lot more. WOOW is packed with dynamic and easy-to-use inbuilt features and advanced theme options that allows you to configure and complete your website with little effort. The theme also included the popular Revolution Slider and Visual Composer page builder to help your site building process more fluidly. Glorious is perfect for any store niches such as fashion design, electronics, mobile, foods, jewelry, tools, auto & spare parts and multi purpose stores. All of the pages can be customized to your own liking. It also has a professional and clean aesthetic design that your customers would love. Loja theme is designed for eCommerce websites yet focusing on stunning product image and Lookbook. 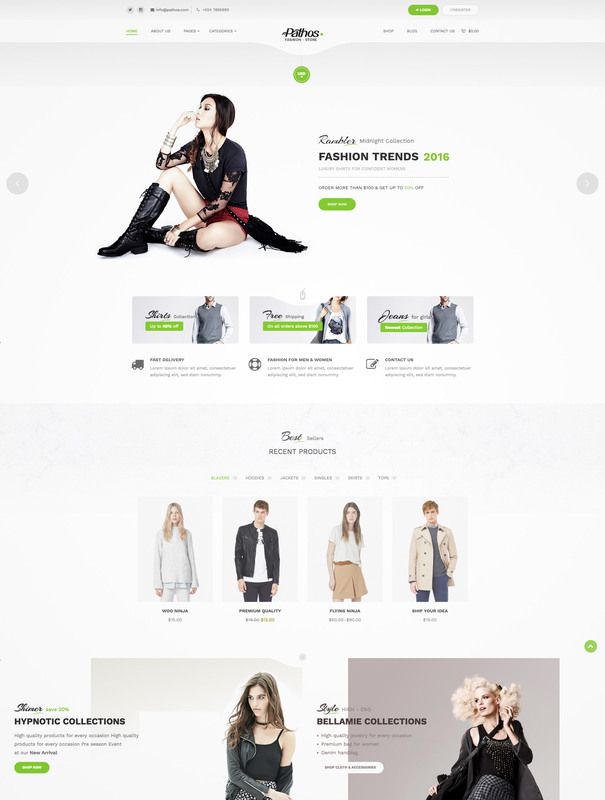 This template is perfect for fashion e-commerce online shop of various niches. It has one-click demo importer, custom shortcodes, product filter widgets, Visual Composer, responsive layout, and other great features for ecommerce. 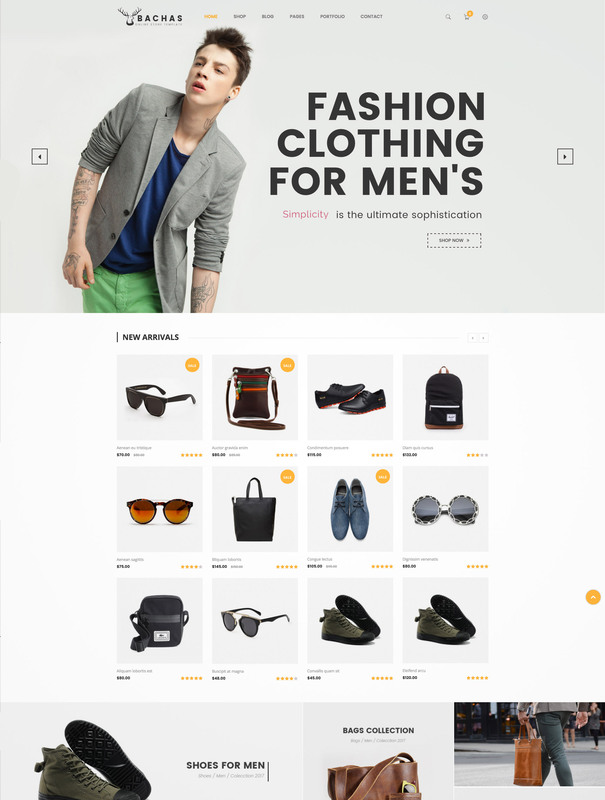 Shopper is a multipurpose WooCommerce Theme that radiates simplicity and functionality as it allows anyone to sell, manage, and distribute products through a clean and creative interface. This theme also makes purchasing easier, which is great for your customers a well. 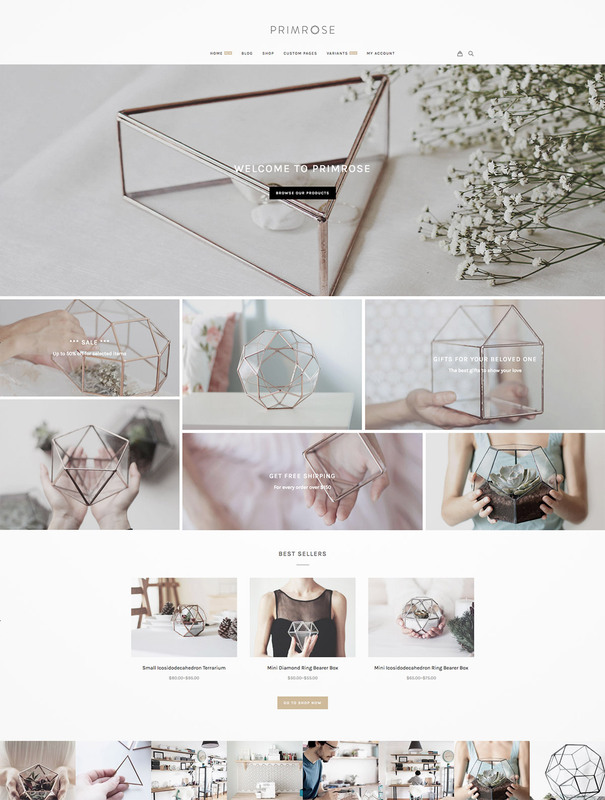 Bow is a WordPress theme that is compatible to any online store. It is built with Bootstrap for a responsive layout and it is created by using the latest HTML5 and CSS3 technology. This theme is very customizable with custom shortcodes, custom metabox and powerful theme options. It also includes a free lifetime updates, built-in theme customizer, Google fonts, limitless sidebars, boxed and full-width layout, etc. Wingman has a modern and stylish design that will definitely make your customers’ shopping experience great. It comes with 3 pre-made homepage demos, 4 premium plugins – Visual Composer, Revolution Slider, Woocommerce, & WPML, admin panel, as well as features for ecommerce such as Ajax shopping cart, multi-currencies, product wishlist and compare, quick view, and more. Constitute Shop is WordPress ecommerce theme based on WooCommerce plugin. 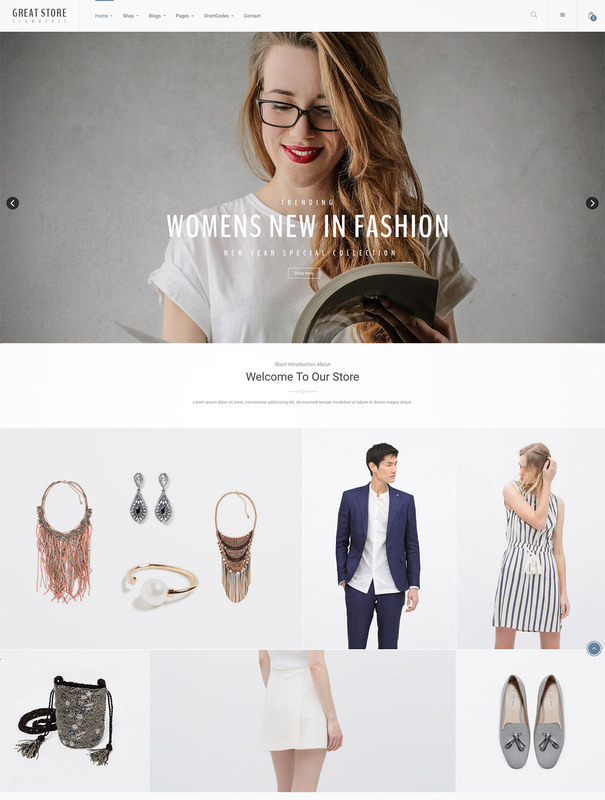 This theme is perfect for clothes, fashion designer store, jewelry, cosmetics, shoes, mega store and multipurpose online stores. It has a powerful admin panel that allows you to edit various elements as you wish. Also, it comes with responsive layout, Font Awesome, fast loading speed, limitless banners and sliders, gallery and portfolio layouts, and more features that can definitely boost your online shop. 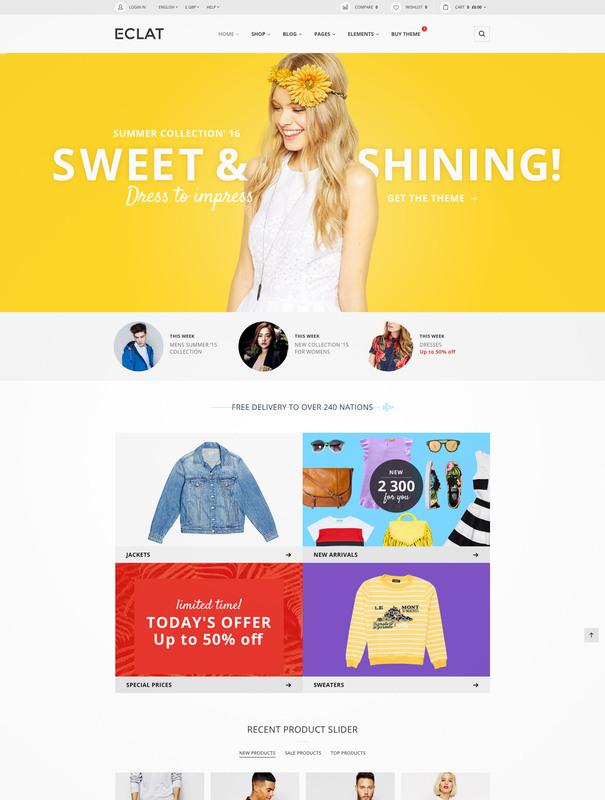 Shine theme has a clean and professional design that will absolutely put your web shop in a pedestal. It comes with Google Fonts, great admin panel, HTML5 & CSS3, Font Awesome, various portfolio and gallery layouts, WooCommerce integration, PSD files, easy to use and customize, and more. 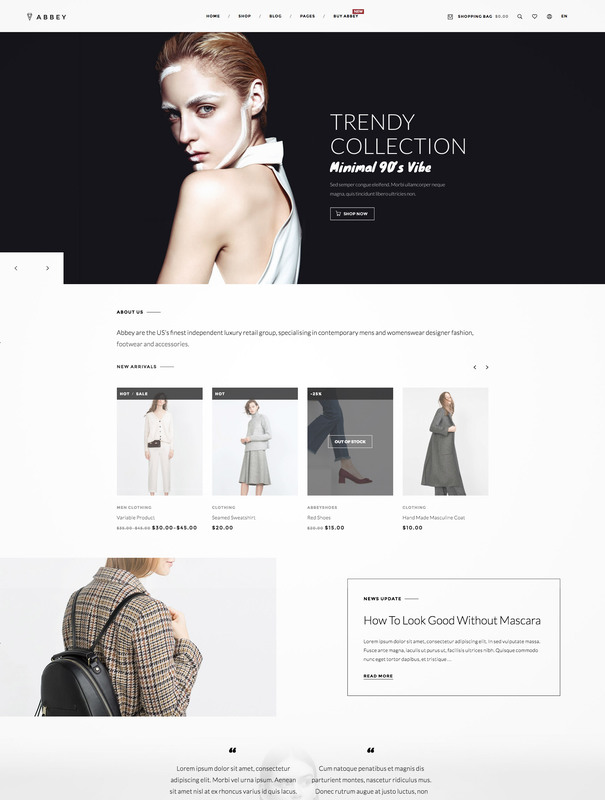 Raymond is a super clean and modern WordPress theme created specifically for fashion, shopping and style bloggers worldwide. A modern blog coupled with a fully styled WooCommerce store means you can write about what you love, and sell the key pieces you mention. The theme includes plenty of customization options that are easy to modify and manage. Hill eCommerce is an advanced theme that is very modifiable and versatile for ecommerce websites. This theme will make your website more eye-catching and easy to manage and customization. Furthermore, it already has 11 demo layouts that you can use or modify. It uses the newest trends in coding with the use of HTML5, CSS3, and bootstrap 3. 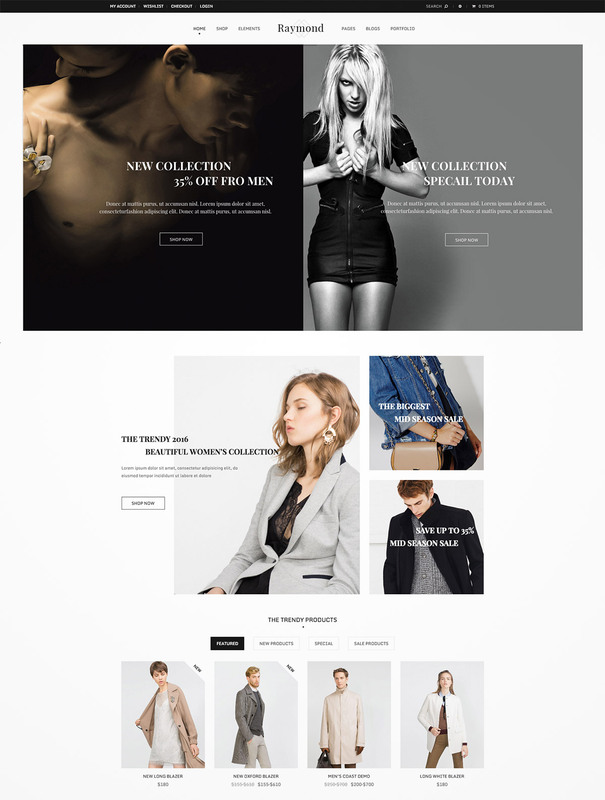 Eclat is another multipurpose WordPress theme that suits perfect for eCommerce websites of any store type like fashion, furniture, digitals etc. Additionally, it has a great number of features and variations including a responsive layout, mega drop down menu, Visual Composer, Slider Revolution, product quick view, one click install and more. 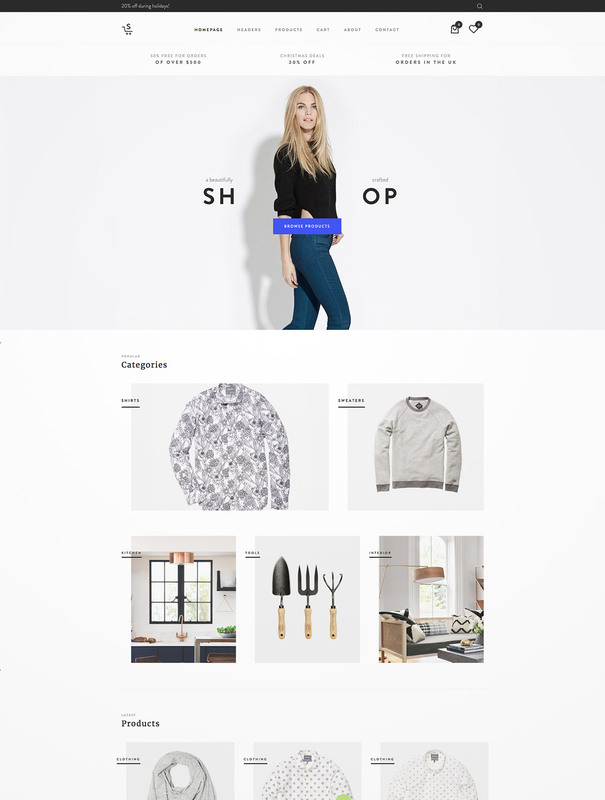 Supershop is a dynamic WordPress theme with modern design and well-structured layer. 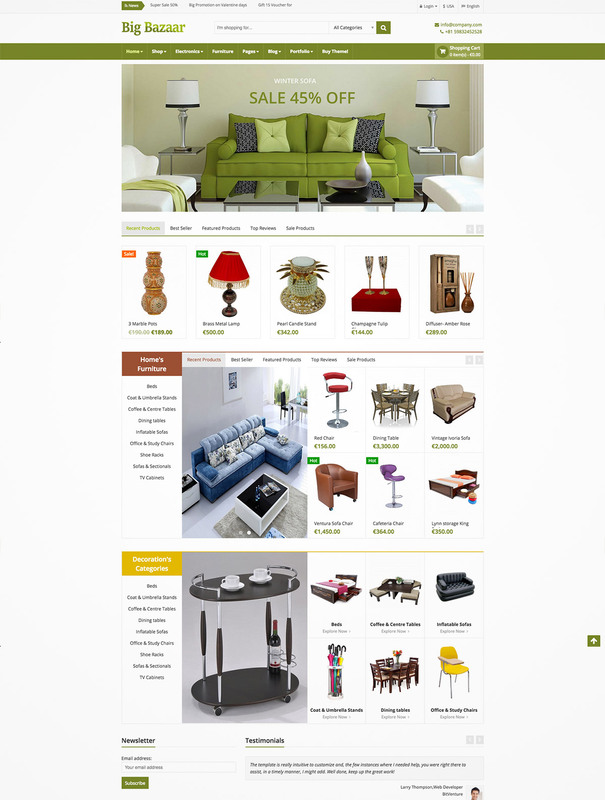 It is an ideal solution for any eCommerce WordPress website, especially for any furniture online stores. SW Supershop comes with a great user experience and usability with Visual Composer integrated, WooCommerce included and Revolution Slider supported. 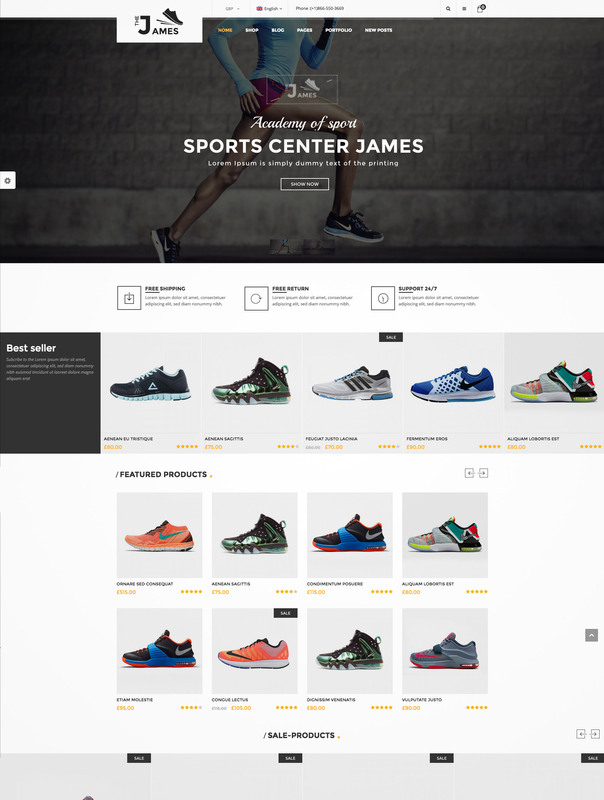 James shoes store WooCommerce theme will make your shop look stylish and inviting that visitors will definitely enjoy. 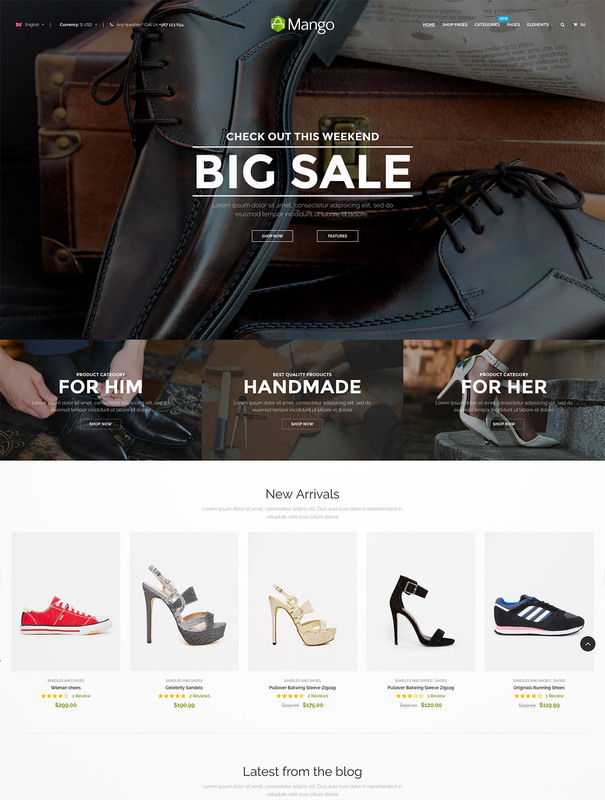 This WooCommerce theme will be a great solution for online Shoes Shop, fashion store, accessories store. 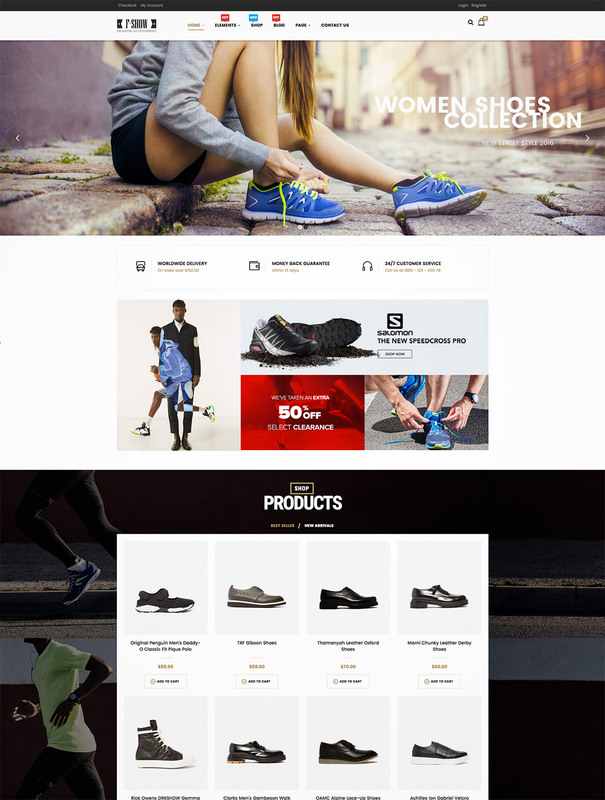 This theme is great with 3 flexible homepage layouts which makes a proper effect on customer as well as awesome features that will boost your online shop. 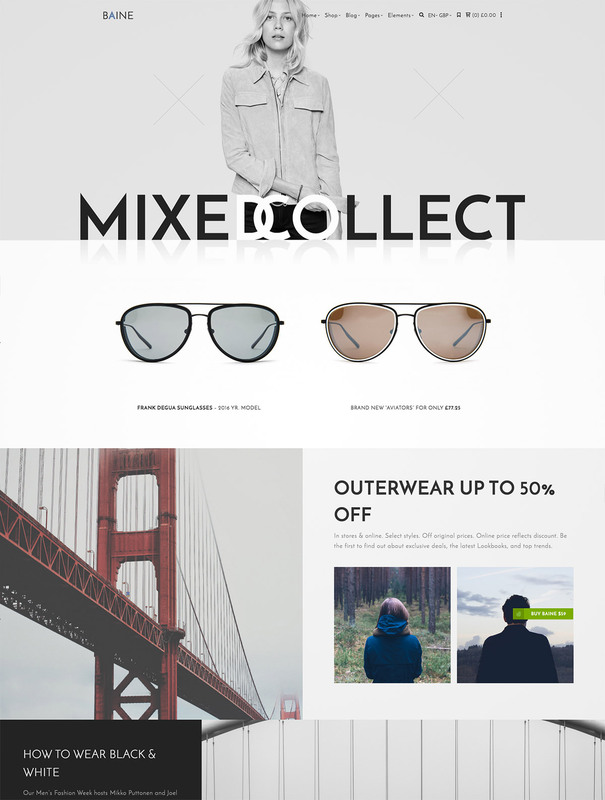 Milano is a responsive theme that comes with Ajax loading, product filtering, 7 homepage layouts, Ajax products, premium features including Visual Composer, Revolution Slider, and PSD files, theme option panel, and more. 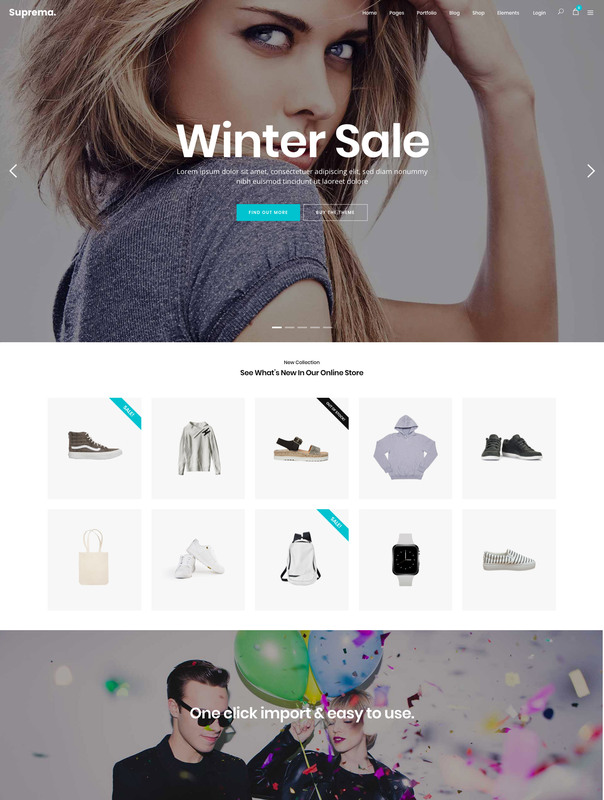 Fshow is a modern multipurpose eCommerce theme that is built with WooCommerce platform. The theme comes with 4 amazing pre-built sites with different design concept, layout, style and color. It is fully responsive, every single element is designed to have outstanding look and feel in all popular devices. 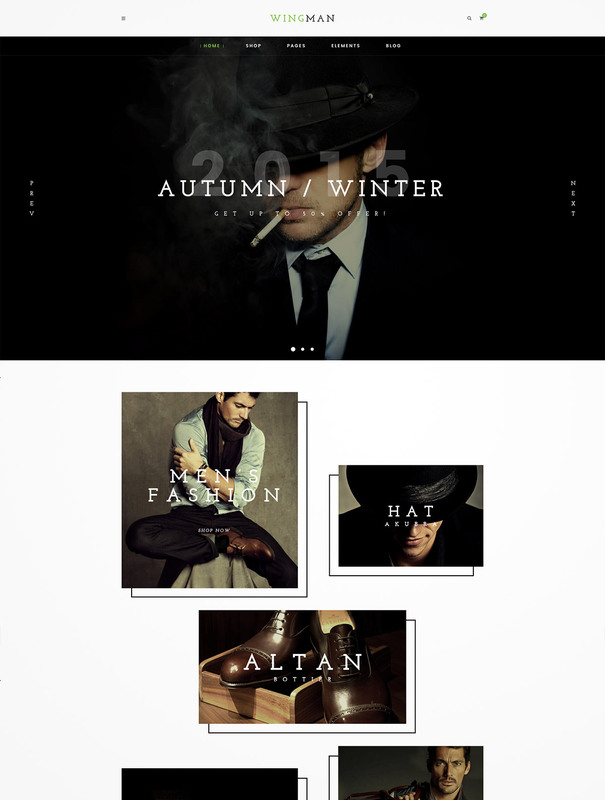 Baine is a multipurpose theme that is completely responsive and retina display ready. 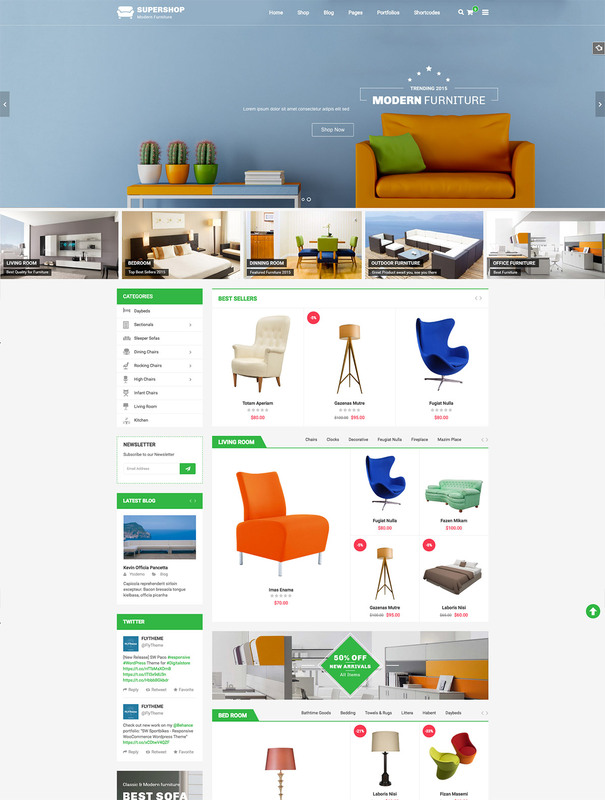 This theme is a right choice for those looking for a quick and veratile online store solution. With help of intuitive visual drag and drop WordPress website builder you can create any page without programming knowledge. Bazien is very modifiable, easy to use and manage, and has a100% responsive layout. It is versatile and is a good match for any type of shops and ecommerce sites. It comes with 6 homepage layouts and skins, and it has huge variation to be suitable for any purpose. Chamo is an accessories WordPress theme that uses the latest script and CSS3 to render mobile layouts and provides a lot of great features such as Mega Menu hat provides dropdown menu with product categories and nice static block; quick view to provide the information of the product via the popup; and Ajax shopping cart. This theme has many more features that will enable your website become more effective and elegant. 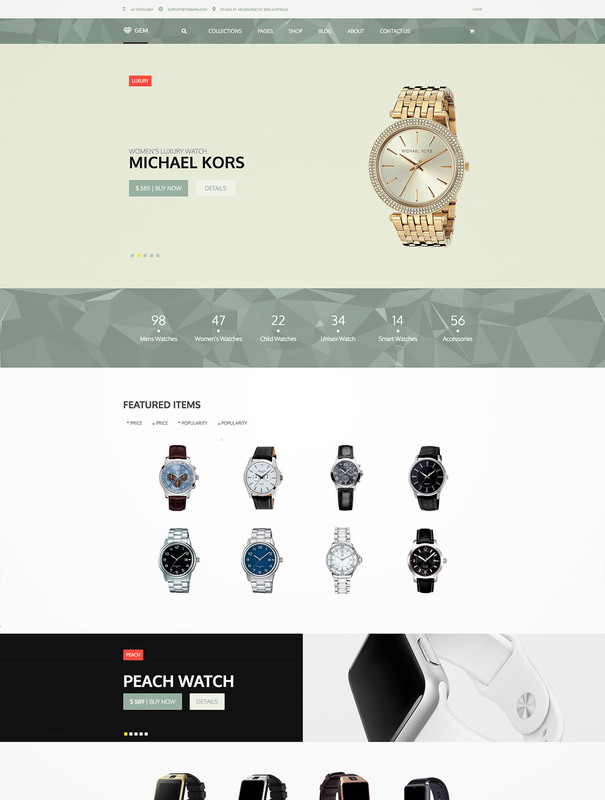 Dezic comes with limitless layout choices and a plethora of awesome features that you’ll surely want for your shop. It’s versatile for every store niche including fashion, retail, furniture, jewelry, accessories, beauty, cosmetic, flowers, and kids toy, to say a few. This theme comes with exclusive designs integration. This allows you to create a professional eCommerce website in a snap.